The following information applies to relevant facts which have been transmitted to the Financial Superintendence of Colombia pursuant to Decree 2555 of 2010 and the regulations amending it. A contract was signed with China Harbor Engineering Company Limited Colombia to "perform the necessary works for the rehabilitation between K16 + 000 to K46 + 234 of the Functional Unit 5 of the road project called Autopista al Mar 2 between Cañasgordas - El Tigre, in the department of Antioquia". Construcciones El Condor reveals its Consolidated Financial Statements as of December 31, 2018. Construcciones El Condor reveals its Separate Financial Statements as of December 31, 2018. On April 9, 2019, Public Deed No. 809 of April 4, 2019, was registered in the Chamber of Commerce of Medellín, which contains the statutory reform and the compilation of bylaws approved by the Shareholders' Assembly in ordinary session on passed on March 29 of this year. By means of Public Deed No. 809 granted on April 4, 2019 before Notary 7 of Medellin, it was formalized the statutory reform previously approved at the General Assembly’s ordinary session held on March 29. The Board of Directors authorized the issuance and placement of Ordinary Bonds of Construcciones El Cóndor S.A. up to the sum of two hundred sixty million pesos, with a commitment to subscribe for securities by Bancolombia S.A. up to two hundred thousand million pesos, for which the pertinent procedures will be initiated to obtain the authorizations. At the ordinary meeting of the General Assembly of Shareholders, which took place on March 29, 2019 in the city of Medellin, the five decisions were made. We attach information for your review. At the ordinary meeting of the General Assembly of Shareholders, which took place on March 29, 2019 in the city of Medellin, the following partial reform of the bylaws was approved. At the ordinary meeting of the General Assembly of Shareholders that took place on March 29, 2019 in the city of Medellin, the profit distribution project that is transcribed below was approved. Construcciones El Cóndor S.A., placed on the market public of securities the third issuance of commercial papers for an amount of one hundred billion pesos. Offers were received for thirty-eight thousand six hundred ten million pesos, which represents 1.38 times the amount offered. It was published in the daily bulletin of the Stock Exchange of Colombia, the notice of public offer of the third issuance of commercial papers of Construcciones El Cóndor S.A.
On February 11, 2019, the settlement act of the contract entered into between Carbones de la Jagua S.A. and C.I. Prodeco S.A. and Construcciones El Cóndor S.A. Through the work realized by the administration, during the quarter we formalized an alliance with ISA, which will allow for the creation of a platform for concessions in Colombia and Perú, that will accentuate each company´s strengths. Simultaneously, we continued work on compliance with our EPC contracts where in order to advance with our projects, it has been necessary to manage different risks inherent to construction as well as maximize efficiencies and innovations and articulate all of the parties involved. Reported that at the ordinary meeting of the Board of Directors held on February 25, 2019 in the city of Medellín, it was approved to present the following partial reform of the bylaws at the next ordinary meeting of shareholders. The Board of Director of Construcciones El Condor S.A., approved the following project distribution of profits. Report on the measures approved to ensure compliance of Circular 024 of 2010 of the Colombian Financial Superintendance. Attached is the memo submitted by the Executive Vice President which consists of instructions for Company employees in order guarantee their an adequate participation in the Shareholder´s Assembly. 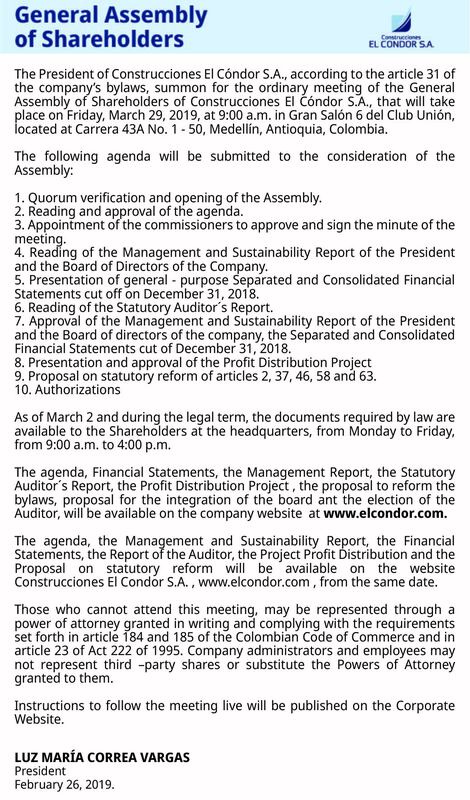 The President of Construcciones El Cóndor S.A., summon for the ordinary meeting of the General Assembly of Shareholders, that will take place on Friday, March 29, 2019, at 9:00 a.m. in Gran Salón 6 del Club Unión, located at Carrera 43A No. 1 - 50, Medellín, Antioquia, Colombia. Was published in the daily bulletin of the Stock Exchange of Colombia, the notice of public offering of the second issue of commercial papers of Construcciones El Cóndor S.A.
Was published in the daily bulletin of the Stock Exchange of Colombia, the notice of redemption of the Series E330 the commercial papers of Construcciones El Cóndor S.A. issued on March 22, 2018. In compliance with the provisions of External Circular 028 of 2014 of the Financial Superintendency, Construcciones El Cóndor informs that has transmitted the Implementation Report of Best Corporate Practices New Country Code corresponding to the 2018 term. The Board of Directors appointed as Personal Data Protection Officer Diana Cristina Yepes Rave who works as Documentary Management Coordinator. Notified of the signing of the Act of Liquidation of the Work Contract No. 1787 celebrated with the INVÍAS for the improvement, maintenance and rehabilitation of the road corridor Riosucio - Belén De Bajirá - Caucheras (Department of Chocó and Antioquia), of December 14, 2018. The contract was terminated for the fulfillment of its purpose and the work was received to the satisfaction of INVÍAS.